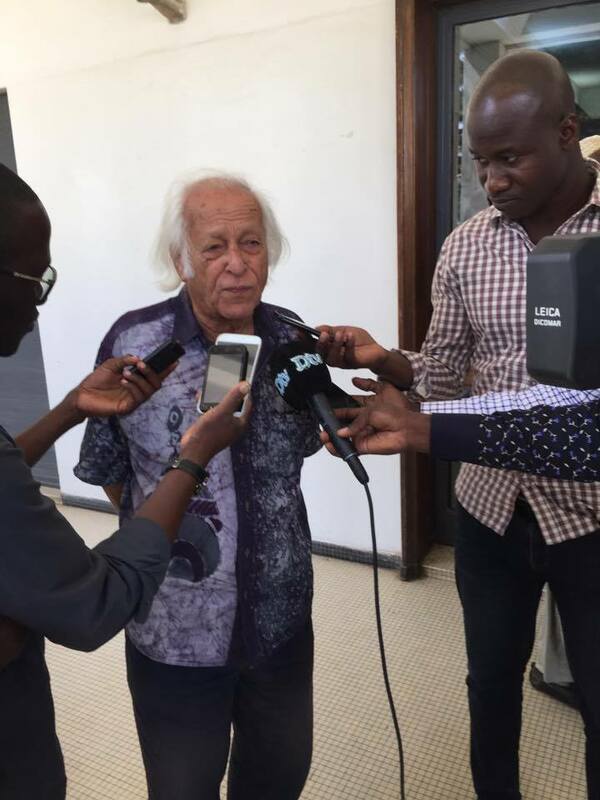 ROAPE’s Leo Zeilig interviewed Samir Amin in Dakar on 5 February 2017. Samir Amin is a Marxist economist, writer and activist. He is one of the continent’s foremost radical thinkers, who has spent decades examining Africa’s underdevelopment and Western imperialism. With great originality and insight he has applied Marxism to the tasks of socialist transformation in Africa. In this interview Amin reflects on a life spent at the cutting edge of radical theory and practice, African politics and the legacy of the Russian revolution. The interview was held the day after he spoke on the 150th anniversary of the publication of Marx’s Capital, organised as part of the monthly series ‘Economic Saturdays.’ These are left-wing economic debates organised by African Research and Cooperation for Endogenous Development Support (Arcade) an initiative established by the Dakar based writer and activist Ndongo Sylla in 2013. So, can I first ask you to tell me a little bit about your political background? How you developed politically, how you became a communist and a Marxist, so if you can go back to those early days? I considered myself a communist already at secondary school. Probably we did not know exactly what it meant, but we knew it meant two or three things: it meant equality between human beings and between nations, and it meant that this has been done by the Russian revolution, the Soviet Union. That was our definition, and at secondary school in Egypt at that time, there were about 40%, say, of the youth who claimed to be communist in that sense. 40% claimed to be nationalists – that the only problem was getting rid of the British occupation and nothing more. And there were 20% who had no opinion. Both the two politicised groups considered the 20% as inferior human beings [laughs]. But the two groups, we were fighting every day, and fighting from the age of 12 or 13 to the age of 16 or 17 in vocabulary but also [laughs] physically. Immediately after my secondary school, I got in contact with the Communist Party in Egypt and I joined it. So, I have been a communist since then. When I was a student in France, there was a rule at that time, that if you were a communist, you had to be a member of the communist party in the country where you were. It was a very internationalist principle, even if you were a foreigner and belonged to another communist party, so I was a member of the French Communist Party during all my time as a student in France. Then when I came back to Egypt, of course, I remained a member of the communist party. These were Nasser’s years. It was a very, very difficult time. I went back to Egypt in 1957 after both the Bandung Conference and after the move, relatively speaking, to the left of Nasser. We had very strong arguments, which opposed the Egyptian communists to Nasser, on the ground that the struggle was not just a national liberation struggle; it has to be associated with radical change on the road to socialism. Now, we were not supported by the Soviet Union at that point. For diplomatic reasons, they wanted to support Nasser, and did not want to have an independent communist party. So, they pressured, they exercised their pressure, that we should accept the theory of the non-capitalist road and support Nasser. Now the communist party at that point in time was divided. Probably the majority, a small majority, accepted the Soviet view of the non-capitalist road, but I was one of those who did not; so a strong minority, perhaps 40%, did not accept it and, of course, I moved to Mali as of this time. That is my history as a communist debutant. And I continue to consider myself a communist. If I can ask you a question about this period from the 1950s when you returned to Cairo in 1957, through the 1960s and even longer than that, you saw your role as an intellectual but was also, someone, if I’m correct, who needed to support projects of radical transformation on the continent, where possible? Where there was space? And you worked as a Research Officer in Cairo in 1957? Working specifically on questions of how this sort of change came about? I was working with a state organisation, which was created for the purpose of managing the whole, enormous public sector, but we had to look at the entire edifice of state enterprises and companies, and to see if their policy was consistent, was radical enough etc, etc. For that reason, this institution was full of communists! The director was a communist, Ismail Sabri Abdullah, and I was second to him. But, Ismail got arrested precisely for that. What I learned there was very important for me. I saw how a new class was emerging. I had to represent the state in the boards of companies, of public companies, and I saw how the public companies were being captured by a small tiny class, a kind of bourgeois caste, a corrupt class, including financing indirectly through their private enterprises. That is what I learnt later in Russian, was called the Matryoshka pattern, Matryoshka, as you know is the Russian dolls, yes? That is you have the state, the big doll, but inside you have smaller private interests. That was exactly what was happening, so I learnt a lot about that process, and I became even more radicalised. This is why, when in 1966, there was the Cultural Revolution in China I supported it. The slogan of Mao was ’fire on the party headquarters’, which means the leadership of the communist party itself. Mao said at that time, you are – which meant ‘we’, the communist party – was building a bourgeoisie, but remember, he said, the bourgeoisie doesn’t want socialism; they want capitalism. Restitution. Can I ask you now to look at ROAPE and some of the issues that were discussed in the first issues from 1974? You wrote in the first issue on accumulation and development and you were part of that project along with Ruth First and others. Can you recall the spirit of that first issue, what you were trying to do, as an intellectual and as a communist with the journal? What was the project of ROAPE? You see, I had a problem, at that time. I discussed with it with some of the early members of the Review. First, why use of this word, ‘radical’? Why not ‘socialist’? Since the only meaning that we can give to radicalism is to be anti-capitalist and socialist. However, my starting point was that we cannot entertain this illusion of the big revolution at a global level, or even a big revolution in the advanced capitalist centres as Trotsky had it. So, we asked the question how to construct a positive block, for such transformation and we looked to Russia and then China, and then Vietnam and Cuba, which we believed were succeeding to do it. This was the intellectual and socialist environment we were operating in when ROAPE was formed. Did you see ROAPE – and its first editorial board – as a militant publication that could help build the movements and politics that were necessary on the continent? Some of them were, but not all, and even those who were militants, they consider themselves more academics than militants. A socialist review should call upon other people, not necessarily academics, who are directly involved in politics, in leadership of movements, social movements and parties and so on. So let us accept that ‘radical’ meant at the time being open to a critique of capitalism, and that was accepted at that point by everybody. But to what extent? A vision that capitalism is there forever, or is there for still a long, long time, and that therefore what has to be done is to criticise it in order to compel it to adjust to social demands. I was not interested in that; let the leaders of the Social Democratic Party do that, if they want [laughs]. We may support some of their demands but we have no illusions in the capacity of the system to be reformed. Therefore there was always this tension in ROAPE and with the changes that have taken place in the world, this academic vision has been reinforced within the journal. What was exciting about that period was that the journal was conceived as a contribution to the projects of radical transformation that were taking place on the continent, so it was no coincidence that it was founded at about the time that Mozambique and Angola are reaching towards independence. And this second wave of radical independence that wasn’t going to make the mistakes of the first wave, but that was going to infuse into national liberation, socialist transformation, gave that project a new energy and initiative and the journal was certainly part of that hopeful project. Did you see things in that way? Did you see the shift on the continent? Yes, you see, my whole life I would say, in Egypt, after having finished my university studies, and then in Mali, and then, at the head of IDEP [Institut Africain de Développement Économique et de Planification], and then as director of the Third World Forum in Dakar, I have maintained a radical critique of society, otherwise none of those institutions which have been able to survive, succeed even, in doing many things.. We have not changed the world but we have kept the flag flying, which is important also. Like some others at the time I saw a long historical transition from capitalism to socialism, and that this is a process that starts in the peripheries, in Africa, and it will continue probably to be so. But in the peripheries, there are phases. The first phase was the struggle for reconquering political independence – a process that extended from the 1950s to the 1970s and which had to be successful everywhere. But there was unevenness between weak and strong independence. These movements for independence were variously associated with social change, progressive social change, more radical in the case of Nasser in Egypt, similarly in Algeria; in the case of Angola and Mozambique, Cape Verde, Portugal’s ex-colonies, yet alongside these radical projects there were others far less radical in countries like, Mali, Uganda, Tanzania, Congo-Brazzaville, and almost nothing elsewhere, including South Africa, which has seen no real social change. But the challenge for all of us, at that time and now, is how do we find the practical policies and strategies for progressive social change? And what are the changes which are needed and possible at each stage? It was here that I came to the idea of a ‘long road’; if the transition to socialism is a long road we should not be surprised that it is full of ‘thermidors’ [since the French revolution the word ‘Thermidor’ has come to mean retreat from the radical goals in a revolution]] and even restorations. This is clear when you look at the apparent victory of monopoly capital, with the breakdown of the Soviet Union, in China after the death of Mao, and of Deng Xiaoping – because Deng Xiaoping was a transitional figure who moved China towards participating in capitalist globalisation etc, – we have entered a new stage of contradictions, so we have been always dealing and discussing those problems. What does social progressive change mean today? Does it mean the possibility of ‘moving up’ within capitalism, or do we orientate in the opposite direction, and intensify the contradictions between an anti-capitalist alternative and what capitalism can offer – in a word are we able to strengthen socialist consciousness? Can I go back a little bit to something that you said yesterday when you were talking about Marx and Marxism, because it seemed to be that you were describing Marxism as a developing and growing theoretical approach and that it’s something that you’ve contributed to in your writing and in your activism…? No. Your own contributions to develop Marxism are very considerable across a whole range of different areas. Perhaps the greatest moment in human history was the Russian Revolution 100 years ago, as an extraordinary demonstration of the self-emancipation of ordinary people. I wonder whether you could talk a little bit about the significance of 1917 and the revolution, its victories and defeats in the decades afterwards for the continent? The Cold War started in 1917 and never ended. After the hot wars of intervention to crush the revolution, then from the 1920s to WWII, we saw different processes. When, after Munich, Stalin wanted an alliance with the democratic countries of the West, Britain and France, against Hitlerism, it was the democratic countries which preferred concession to Hitler, even encouraging Hitler to start the war against the Soviet Union. We should never forget that. The post war world, with the formation of NATO and other anti-Soviet institutions which came out of this period, was targeted at the Soviet Union and sought to maintain the colonial system, which was only defeated by internal anti-colonial forces in the countries of Asia and Africa. Despite the propaganda it was always a polycentric system because it had at least four participants: the Imperialist West, more or less united behind the US with NATO, and the alliance with the Japan, that is the US, at that time Western and Central Europe, capitalist Europe, Japan, plus Australia and Canada, the external provinces of US, one close and the other far geographically. Then you had the Soviet Union, with its dependent countries of Eastern Europe, just as Western Europe was dependant on the US. This was important and a direct legacy of the 1917 revolution. Then there was the Chinese revolution in 1949. So you also had the non-aligned movement, which means all the countries of Asia and Africa achieved their independence under the leadership of the most advanced amongst them. All of this means that we had in that time, not a dual power, but a polycentric system, unequal but with margin of manoeuvres. What were the abiding lessons or experiences of that successful revolution for the continent? There are many lessons. The major one is that we have moved into a long transition where it is possible to start moving towards socialism in many places in the world. That is one. That is fundamental. Second, it has to be, ‘a strategy of stages’, one after the other. Instead of calling it ‘revolution’, I call it revolutionary advances, which means that we achieve revolutionary changes but which only create the possibility of later, further revolutionary advances. Yet it means that the revolution can be stopped and decline in one place, and this is what has happened in the Soviet Union. Another lesson is that revolutionary changes were successful in October 1917, precisely because the Soviet Union was able to construct an alternative united block, which was the workers-peasants alliance. My one worry is that the effect of the failure of the Russian Revolution was to set back in ways that perhaps we didn’t expect in the early 1990s, the language of socialist transformation, of revolution, of social revolt. Yes, and we should learn that the forms of struggle, which were probably correct in their time, last century, almost 100 years ago now, are no longer blueprints for us. There are organisation forms that no longer respond to our questions today, so there is a question today, terribly difficult to answer, of how to organise, in what type of organisations. However, my friend, Abdulrahman Mohamed Babu, used to say that, “You organise or agonise”. [Laughs]. You don’t agonise about organising. Yeah, but simultaneously I reject completely the naïve view that we can change the world without seizing political power; that is changing state power. On that point I remain intransigent, I would not say dogmatic, but I would say this principle is the evidence of all history – so the problem is now how to conceive of the organisation of the movements, which could crystallise into a political force, able to challenge and ultimately change political power. There’s the wonderful metaphor in Trotsky’s, ‘History of the Russian Revolution’, where he talks about the Piston Box. The Piston Box is the revolutionary organisation, but without the steam of mass participation, the Piston Box is an inanimate lump of metal. It’s a powerful image, so what are the forms of organisation for today? This is what we are discussing continuously. I have no blueprint or easy answer. There are a good number of leaders and activists within the social movements, who are drawing lessons from their relative failure. Can I talk just briefly, about two of your – what I consider – very significant contributions, ones that made a big impact on me. You referenced this yesterday, where you talk about Marxism as a living theory, a living philosophy. You contributed to the understanding of Marxism and history very significantly in Eurocentrism a book that was written in the 1990s, which challenged a Stalinist notion of stages of historical development. What were you trying to do in that book and what were you trying to say? It seemed to me that one of the things you were saying is that the transition from what had been understood as feudalism to capitalism was actually a far more complex process, which you described as the tributary system that took various forms across the world. Could you just mention something about your argument and what you were doing? So, I said there had been three great revolutions of modern time: the French, the Russian, the Chinese and these three big revolutions are big precisely because they have given to themselves targets which go far ahead of the objective problems and needs of their societies at the time of the revolution. That is the definition. So I was – in part – arguing that we are at a time of big revolutions, in that sense, even for smaller countries. Your argument in the book was that it was a weakness of state formation – a sort of underdevelopment – in Western Europe that allowed the transition to capitalism to take place to a certain extent. So, you were reversing an argument, a Eurocentric argument that’s often made? Yes, I dared even to write that the most advanced parts of the pre-capitalist world, were not where change starts. It is rather at the peripheries. Now, the most advanced system before capitalism spread across the world was not in Europe; it was in China and that has been recognised again today – though it had been recognised in the 18th Century. China, was the model for the Europeans. They were aware that not only had China, if we use the economistic language of today, higher levels of productivity of labour than Europe at that time, but it had better organisations – across all layers of society. Democracy was not on the agenda, but China had invented, ten centuries before the Europeans, a civil service. You have to wait until late in the 19th Century to have a civil service in Europe, the idea of recruiting bureaucrats and civil servants of the state by examinations and so on, which was invented a thousand years ago in China was unheard of. I would argue that there are the same type of contradictions today. The power of the most advanced, the US today for example, also cripples the developments of a new society…. The US is the most advanced capitalist country but it is the country where socialist consciousness is at its weakest globally. The ideas of socialism are close to zero even as compared to European countries today, where it is not far from zero, but it is not quite zero. Can I ask you now about a second, very important book that you wrote in the mid-1980s, I think in 1986, Delinking? In the book you argued for the need to escape from the constraints of a global capitalist system and therefore countries in the periphery had to break those connections which had strangled any hope for economic development. Delinking, is a principle of strategy. It is not a blueprint. So it means that instead of adjusting to the needs of capitalist, global expansion – which involves deepening underdevelopment, polarising the world more and more – that the pattern has to be broken. Instead of what I called in my PhD dissertation in 1956, ‘permanent adjustments of the peripheries to the needs of capital accumulation in the centres’. I used this phrase, these exact words – underdevelopment is a way of describing what is in fact permanent adjustment. What do all banks says today, structural adjustment or change, this is now a permanent state. With the World Bank I put it in a slightly polemical way: I said it is requested that the Congo adjust to the needs of the US, not for the US to adjust to the needs of Congo. So, it’s that adjustment, which is simply one side adjusting. Now, delinking means you reject that logic, and therefore you try to, and succeed, as far as you can, to have your own strategy, independent of the trends of the unequal global system. You were, in the 1970s, perhaps unfairly criticised by some on the left as promoting a national bourgeoisie. Yet it seemed to me that you were saying that the project of delinking needs to be one powered by popular forces. So, in that case, can I ask you to speak directly as an activist, Samir, what is the agenda and project for radical or socialist transformation on the continent today? The people, all the peoples of Africa are today facing a big challenge. So their societies are integrated in a pattern of so-called globalisation, that we have to qualify, because this is not globalisation, it is capitalist, imperialist globalisation. This is control by financial monopoly capital by a set of imperialist countries – principally the triad: the United States, Western Europe and Japan, which are strong enough to control the processes of economic life and production and therefore also political life at a global level, and we are invited by the World Bank and others, simply to accept it and to adjust to it. Now, we must move out of this pattern of globalisation. That is the meaning that I am giving to the word, ‘delinking’. It means rejecting the logic of unilateral adjustment to the needs of further capitalist and imperialist expansion, and trying to reverse the relation and focus on projects of development ourselves. I think if we start, we will succeed, that we will compel imperialists to accept it and that would create a logic, a possibility of further advances. This is what I am calling a sovereign popular national project for Africa. National, not in the sense of nationalist, but with the meaning that political power must be changed, and political power can only be changed in the frame of the countries and states as they exist today. It cannot be changed at global level or even at a regional level before being changed at national country level. It will be popular in the sense that this is not a bourgeois, capitalist project, yet these steps cannot be achieved while accepting the pattern of globalisation and capitalism. Finally can I ask you how you have been able to maintain your own phenomenal positivity and energy over the years, in the face of the failure of progressive movements? Well, one reason is that I was condemned not to survive my first years and that compelled me to develop a terrific will of struggle in the 15 first years of life. I think it was turned to an advantage of having been weak, physically weak. Okay, but then there are some political reasons. My struggle in the Egyptian Communist Party between the Soviet line and the Maoist line, also compelled me to try to be rigorous and continuously on the frontline, politically and ideologically. I also continue to be active in different places: in the Third World Forum, and the World Forum of Alternatives, living in both Dakar and Cairo. I happen to also be the chairperson of the Egyptian – so-called Arab – Centre of Research which is radical in the sense of being a socialist centre, not only in Egypt but in the whole Arab region. I am active – action is key. Moving between Dakar and Cairo. I also remember yesterday about how, as Marx does in ‘Capital’ and in one preface to ‘Capital’, when he hears that later editions were being read by workers, that nothing could make him happier. And you said yesterday Capital required considerable work and there’s no greater evidence or need for that than the constant study necessary to understand and change the world. And this is not making something vulgar, or simple. Vulgarisation is a very dangerous thing. It is…trying to translate a complex problem into a simple one, and that’s dangerous because the people have to understand that a complex problem is a complex problem, but they have to understand it, that’s the whole difficulty – but one that can be achieved. Samir Amin is a long-standing activist, writer and communist. Many of his articles on African development, capitalism, imperialism and accumulation are available to roape.net readers who log-in/register here. Always great to read or listen to Samir Amin. well done – Leo – a fascinating and captivating interview. Much here to contemplate – most immediately perhaps for readers, supporters and contributors to RoAPE as a radical academic journal/organisation/presence. But also the revisionist version of ‘de-linking’ for the modern age – not so much breaking way on the basis of ‘national’ capitalist development but of popular protest, dissent, struggle and contestation against the status quo of ‘globalisation’ – inspiring! In the opening paragraph of his interview, Samir Amin makes a distinction between nationalism and communism. However, there are many variants of Marxism and Karl Marx himself made the memorable quib, “all that I know is that I am not a Marxist”. From the rise to power of Stalin in the late 1920s, the major school of communism for most of the 20th Century was the official ideology of the Soviet Union. Samir Amin describes how this was foisted on to the world Communist Parties. This idea, for example, developed the stages view of revolution, first we have the national democratic revolution and, at a later date, after the productive forces have matured, it will be possible to have a socialist revolution. Samir Amin did not support the idea of communists giving support to Nasser in the late 1950s, but he does apparently support the counter-revolution of General Issa in modern Egypt. He also rejects the ‘Trotskyist’ idea of a global or continental socialist revolution of the working class. So, for example, in South Africa, with the overthrow of apartheid in 1994, we have had the ‘national democratic revolution’ with the associated rise of neoliberalism, privatisation and levels of inequality that are now greater than they were under Apartheid. In Hal Draper’s terms, we have socialism from above of the ANC, and we have socialism from below in terms of the industrial struggles (and the Marikana massacre), and fights against the privatisation of water and electricity. I would argue that Marx himself would have associated more with this struggle of the working class, from below, and the idea of socialism as being the self emancipation of the working-class rather than the version of Marxism that Samir Amin has so successfully promulgated. I would argue that Samir has failed to break completely and clearly enough with nationalism. In Africa now there are few progressive aspects of nationalism – witness the Xenophobia in South Africa. 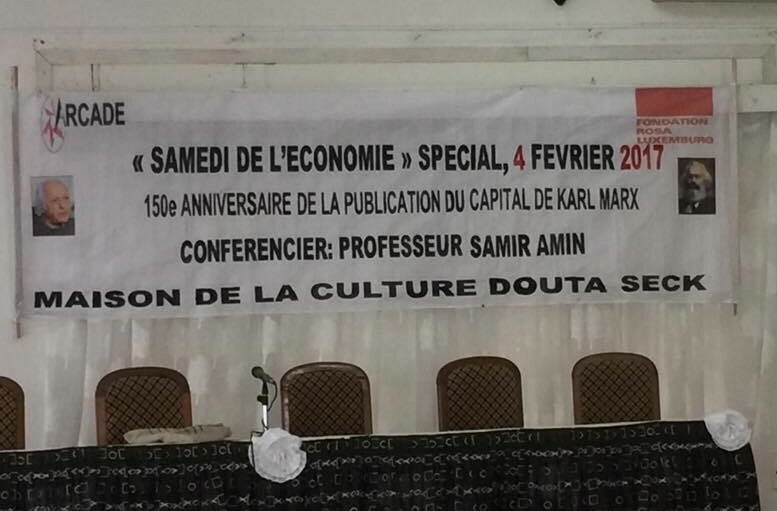 Across Africa, the ideas of ‘left’ nationalism is dominant (partly due the fact that people like Samir support it), but we need to counterpoise the traditional Marxist idea of class. The working class of Africa from the Arab Spring in Egypt and Tunisia, to the industrial struggles of Nigeria, Kenya and South Africa (to name but a few), mean that across Africa the working class has the potential to move far beyond building national democracies, as in South Africa and Egypt. But this is the idea of socialism that Samir has consistently argued against. Instead, he suggests that the Eastern European countries were socialist after 1945 (due to Stalin’s invasion rather than any collective action by the working class) and fudges over China. If there was a socialist revolution in China, then when was the counter-revolution? What are the lessons of these histories? Samir does not appear to have an answer. Instead he calls for “a sovereign popular national project for Africa” which appears to be the left-face of the Stalinist ‘national democratic revolution’. Samir has provided some excellent critiques of the effects of imperialism in Africa, but he has given away too much in the arguments against nationalism. The key problem with his strategy is that on a day-to-day basis the working classes of Africa are fighting against their own corrupt ruling elite. It is this daily struggle on which Marx based his hope for the future socialist society. We need to support these continuous local struggles and the high-points like (and of) the Arab Spring (and 100 years ago the Bolshevik revolution in Russia) when the national boundaries are quickly breached. I am in no position to answer for Amin but the counterrevolution in China may be pinned down to 1978 or thereabouts (as Amin’s take here on Deng, indicates). Amin’s position on China is controversial of course but his sympathetic analysis of the lack of private property in Chinese agriculture (especially in Beyond US Hegemony) is a breath of fresh air when compared with the usual mainstream narrative (and might, just might, be a well founded Marxist analysis of the situation). Supporting dictatorships is terrible, and Amin’s permissive attitude when it comes to strongmen has been noted, and I would not like to be dismissive of Andy’s very valid point there. However, trying to abolish (in the short term) the state, may create the kind of fuzziness that Zizek so rightly points out throughout his work (and of course he accentuates by his Stalin posters and glaring fixation on the generalissimo… ). I think Amin himself does us a real service when his analysis engages with existing states especially in the global South, pointing out how delinking is possible. Samir has been very useful in critiquing the management of the African economy by the “compradors and charlatans”, but he has over emphasised the role of ‘imperialism’ and the industrial countries in Africa’s failure to develop – this must be placed squarely at the feet of African governments and other elites who have looted rather than developing equitable societies. As an example, the GDP of NIgeria has doubled since 2000, but almost all this wealth has been taken by the one per cent. Redistribution of wealth is now more important than creating further wealth (and climate change etc is ruling out continued economic growth globally). We need to rely on the power (actual and potential) of the African working class to see a massive shifting of existing wealth from the one per cent to the 99 per cent. I think Samir has done a great job in bringing to our understanding the rapacious nature of contemporary globalisation in its unequal form.Where I think Samir has remained silent is the partnering role played by African leaders in deepening inequality and backwardness on the continent. Andy Wynne was correct in pointing out the collaborationist role played by African leaders to foster imperialist interests in the continent.With such pillage of wealth even by our own leaders, constructing a sovereign national project as Samir suggested might be very difficult unless there is a sweeping change in local politics in the direction of social progressiveness.